La Rochelle is the transport hub for this stretch of the coast of Atlantic France, with good plane, train, bus and car connections. Aéroport de La Rochelle/ Île-de-Ré (LRH), 6 km (4 miles) northwest of the Gare de La Rochelle and the city center (map), serves flights by easyJet, flybe, Hop!, and Ryanair from Ajaccio, Brussels, Lyon, numerous airports in the UK and Ireland, Portugal and Switzerland. The Gare de La Rochelle SNCF serves fast TGV trains as well as regional TER Poitou-Charentes trains. 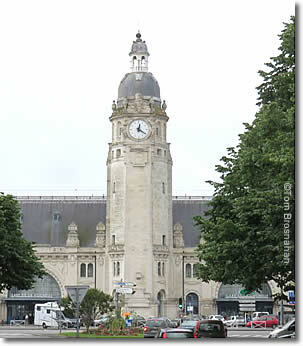 The fast trains cover the distance between Paris and La Rochelle in about 3.5 hours; to or from Bordeaux in 2.5 hours. Regional TER Poitou-Charentes trains also connect La Rochelle to Nantes, Poitiers and other destinations in the region.